Q. LK Advani said ‘nation first, party next, self last’. You endorsed this. But Advani also said people with differing views shouldn’t be termed anti-nationals. A. He has stated the basic principles of the BJP. These are our principles. All BJP workers say the same. The nation is supreme, the party is next and the self is last. Even on the issue of nationalism, this remains our stand. It’s the Congress that is to blame. Do you know a Congress leader termed Vajpayee a traitor? Do you know that on the floor of the House, a senior Congress leader who recently passed away called Atal ji a traitor? So, Advani ji is absolutely right. "The UP election was fought on the issue of demonetisation and we came out victorious. So people who have suffered due to demonetisation – those who lost their vote bank of the poor and those who were unable to carry out their black money dealings -- they are the people who suffered and even today, they are crying. But the people of India know full well why they are complaining. Demonetisation is the reason why our formal economy has risen so fast," Modi said in an exclusive interview with News18. He also said that the number of people paying income tax in the 60 years since independence has doubled in the last five years. "More than 3.5 lakh companies – hundreds of them operated out of tiny rooms – all illegal outfits that ran a parallel economy, that ran hawala networks and looted the economy, were identified thanks to demonetisation and their operations were stopped. Crores of rupees that were disclosed entered the government coffers. I believe that if we hadn’t carried out the move, the formal economy would not have been able to take off. Only the parallel economy would have been visible. Property prices fell because black money disappeared," he added. Q. Demonetisation was among the most controversial of schemes you introduced. There’s 19% more cash in the system now (than in 2016). All currency is back in the system. How do you view demonetisation? A. Your calculation is flawed. First, the fact is, if we go by the earlier rate of currency entering the system, there would have been a far higher volume of currency today (if demonetisation had not happened). It must be seen in the context of growth in currency figures. It is wrong economics to break it there and link it here as you are doing. Second, big people whose businesses were hit and exposed by demonetisation have still not been able to recover from the blow. But the common citizen who suffered initially due to demonetisation stood by us. Q. What would you like to say about the progress of the economy over the last five years? Are you satisfied with the present 7% growth rate? A. If a person believes in development, he should not be happy even with 10% growth. Sometimes not being satisfied is a source of energy. So, whatever the achievements, I keep that non-satisfaction within me alive. But it’s a matter of pride for us that all global agencies – World Bank, IMF, rating agencies – have unanimously said India is the fastest growing major economy in the world. It’s a matter of pride for all of India. But there’s huge potential and we want to achieve greater heights. Q. You have spoken on the contribution of several leaders including Sardar Patel. What are our views on Pandit Jawaharlal Nehru? A. Wherever the nation has reached today is due to contributions of all governments. All state governments have contributed. People who ran those governments have contributed. But our complaint is – if Sardar Patel had been the country’s first prime minister, priorities would have been different, the pace would have been different. The country would have achieved newer heights much earlier. The work I have had to put in since 2014 to construct toilets would have been done much earlier if Sardar Patel had been the prime minister. A. I didn't raise the finger against corruption, corruption is an issue for us. Just see what happened in Bhopal. Bhrasht Nath can say anything but it doesn't matter (reference to Madhya Pradesh Chief Minister Kamal Nath and the IT raids on his close aides). Shouldn’t action be taken against scams and corruption? The National Herald case…did this happen in our time? Did Lalu Yadav's case happen during our time? Whatever was put in cold storage, we thought that we should take it out and let it take it's due course in the name of law. Now if these things come forward then the person who has done them needs to come forward too. They did do something wrong that's why they are asking for bail, both mother and son. A. Definitely not, I have never done that. I am ideologically opposed to dynasty politics. I have never attacked them personally. That's why, to gain sympathy from saying that I have done so..'Modi humare saath yeh karrahe hain, Modi humare saath..' there is no anger. It is an ideological belief, dynasty politics is bad for India's democracy. Q. How do you see Rahul Gandhi’s contesting from two seats? His decision to contest from Wayanad? A. The Constitution allows anyone to contest from two seats. Nothing wrong with that but the situation under which he has had to run away from Amethi is the real issue. Having to run away from a seat that has been the family heirloom is an issue that must be talked about. Q. Till about a year back, Ram Mandir was a hot topic. You have put it in the manifesto too, it was also there last time. But it’s been seen that your leaders have been silent on Ram Mandir over the last 6 months. Has the issue lost resonance? A. The problem is with the media. When we speak about it and they say ‘you have no issue but Hindutva’. When we stay silent on it they say ‘why don’t you speak on ram mandir’. The BJP’s stand on the issue has been consistent. We have taken an ideological stand on the matter and have never changed that stand. Q. Is there a possibility of a post-poll alliance with Jagan Reddy and K Chandrashekhar Reddy in Andhra Pradesh and Telangana respectively? A. BJP will win with full majority. We will win with a bigger seat tally. Nda is an additional strength with us and its tally will also rise. We will be in a position to form the govt with more than the required majority. We will not need anyone's help to form the govt. Our aim is not just to form or run the govt, our mission is to run the nation and take it forward. This is possible only through general consensus. We will thus take along even those parties who send one MP to Parliament. No matter how strongly a party opposes us, we will take them with us because our mission is to take the nation forward. Q. Amit Shah says BJP will win more than 23 seats in West Bengal. He says in Odisha BJP will win 11-12 seats. Do you think this is possible? A. I don't go into figures. But Amit Shah is the most hard-working of all leaders. My campaign gets media coverage but not his. I don't think any national party leader works as hard as Amit Shah throughout the year. Not just during elections, Amit Shah meets local party workers and understands issues on the ground. The BJP is benefitting from this level of hard work. I therefore trust his assessment all the more. Q. In the last five years, the BJP has done a lot of work in West Bengal, Odisha and the North-East. How many seats do you expect from these states? Do you think you can raise your tally in West Bengal? A. The BJP will expand its footprint across the country. We are rising across the country and so our seat tally will go up. We will maintain our hold where we had won the most and boost our vote share. Where we lost one or two seats, we will make gains. Across the country there is a wave in our favour. Q. So you feel that in Uttar Pradesh this arithmetic won't work? In 1993 when Kanshi Ram and Mulayam Singh Yadav joined hands, the slogan was 'saath main Mulayam-Kanshi ram, udd gaye ai Shri Ram'. Are you not worried by the 42-45% vote share that this gathbandhan is can command? Q. Apart from nationalism, what are the other issues that you will highlight to the voter? A. The number one issue is development, and it is two-fold. One is related to social infrastructure, the other is physical infrastructure. There are a lot of people in India who are still deprived of basic facilities. We have to provide homes to the homeless, medical facilities and education to the poor. We have to ensure that every citizen can live with dignity. We need to ensure ease of living. India's new middle class is its biggest strength. The previous governments ignored this section. We believe the middle class will play a big role in taking the country ahead. The middle class respects the legal system, follows the law and abides by rules and regulations. The middle class pays taxes honestly, and demands the least from the government. Our job is to protect them from harassment. The Congress party has been insulting the middle class, their comments in the last few days are unacceptable. Q. Your party has always advocated scrapping Article 35A and Article 370. You spoke about it in BJP's manifesto too. The moment your manifesto was unveiled, the opposition pounced on the issue. Some valley parties warned that if articles are scrapped there will be bloodshed. Farooq Abdullah and Mehbooba Mufti spoke on the issue. What do you have to say? A. The problem in Kashmir is largely due to the 50-odd political families there. They have been milking the issue. They don't want any benefit to be given to the ordinary Kashmiri. They use public sentiment for political gains. These days the income tax department has cracked down on such elements. While stone-pelters are funded by Pakistan to protect militants, but when there is crackdown by the NIA on terror operators, people stand outside their homes and clap. The people of Kashmir want freedom from such political families who have been preying on their emotions for 50 years. The situation in Kashmir is such that people want change, whether it is about Article 35A or Article 370. Q. Let's talk about elections -- do you think the biggest issue today is nationalism? Opposition parties claim that you are trying to divert attention from real issues. A. Nationalism means 'bharat mata ki jai'. If I am saying 'bharat mata ki jai' but my motherland is in pain, how is my nationalism justified? If I try to deliver clean India, isn't that nationalism? If I put a roof over the heads of the poor, isn't that nationalism? If the poor don't have the money for treatment in hospital and face death, is that nationalism? What is nationalism? Should I leave the poor to die or provide them Rs 5 lakh benefit under Ayushman Bharat? Isn't that nationalism? The farmer can use modern techniques and get full price for their produce, they can get 1.5 times the MSP. Isn't that nationalism? Isn't it nationalism if we provide our forces with the latest weaponry? That's why I say that the definition of nationalism is dynamic. 'Bharat mata ki jai' is the 'jai' of 1.3 billion people in India. If I can provide opportunities to people to improve their lives, that in my view is nationalism. And if that is the definition of nationalism, then we are nationalists. Our nationalism is for the benefit of a billion Indians. Q. Do you think your alliance with PDP was a mistake? When can we expect Assembly elections there? A. The alliance with PDP was an experiment. The Kashmir mandate was a fractured one. No single party could have formed government. We waited for a long time in the hope that PDP and NC would ally, but they could not see eye to eye. Forming government was the democratic option. Mufti saheb was senior, we started talks after 2-3 months. We had always maintained that our ideologies did not match, but we came forward to shoulder the responsibility. We thought we'd attempt the experiment, and it was working well during mufti saheb's time. When Mehbooba ji came, she was very reluctant. She didn't step forward for 2-3 months, which forced governor's rule in the state. Later she asked for our support and we gave it. But when it came to panchayat polls, she kept delaying it saying it would spark violence. Recently, West Bengal saw violence during panchayat polls but in Jammu and Kashmir where was zero violence during panchayat polls. This is something the media overlooks. Even unbiased media ends up fuelling the Kashmir narrative by its continuous coverage of terror attacks. But they must also show the progress and the growth of the Kashmiri people. Q. The Kashmir issue is linked to terrorism. Vajpayee spoke of jamooriyat, kashmiriyat and insaaniyat. You told me in our earlier interview that Kashmir wants development and also trust. How do you see this problem now? A. This problem is a very old one. Perhaps if Sardar Vallabhbhai Patel had handled it, we would not be in the situation we are in today. He would have found a solution, like he did with Junagadh and with the Nizam. But Pandit Nehru kept this issue to himself, and since then it has been mired in controversy. So far, thousands of our soldiers have died. We have not held back on spending on development. India has not done anything that should make Kashmir feel neglected or unfairly treated. But we must treat this issue with sensitivity and understanding. Earlier governments have fallen short in dealing with this issue. Secondly, there is no problem in Ladakh, there is no problem in Jammu. It is only a couple of districts in the Srinagar valley where there is a problem. We see these two and a half districts as the whole of Jammu and Kashmir. This narrative must change and this is where the media must help. We must recognise the progress there, for example, in sports and in competitive exams. Any top university in India today has Kashmiri students. We must encourage this. They just had panchayat elections, which saw 70-75% voter turnout, and thousands of panches and sarpanches elected. This was long overdue. Now they found an opportunity and have got down to work. Similarly, there must be investment and job opportunities in Jammu and Kashmir. Articles 35A and 370 have been standing in the way of progress and employment. No one goes there to invest. We can build IIMS but professors are not ready to go there, their children don't get admission in schools, they can't find homes. This ends up harming the interests of J&K. Pandit Nehru's policies stand as an obstacle for J&K today. We need a re-look. Q. There is a sentiment in the country that we should boycott Chinese goods and stop trade with China. Do you agree with this view? A. Today's world is not bipolar. In this globalised era, all nations are interdependent and connected. International laws are in place, and we are signatories to WTO. As a government, our official stands must align with international rules and regulations and India abides by that. As far as public sentiment on Chinese goods is concerned, that is up to them. We, including the media, should guide the public. Q. Have you had any talks with China after the veto? You say there is a continuous dialogue, were there talks after the Masood Azhar move as well? A. All issues are discussed in all meetings, so was this one. This issue had come up earlier as well. Q. China is also linked to Pakistan. China has used its veto at the UN on Masood Azhar for the fourth time in 10 years. So how should we deal with china? A. On one hand, there is our bilateral relationship with China. We have a political engagement with China, we have investments there, and they have investments here. Our leaders go there, their leaders come here. Amid all this, there are border disputes which are still unresolved. India has one perspective, China has another. So both sides have accepted that we have differences, but our objective is that these differences don't turn into disputes. And if there are such incidents, then we hold high-level talks. This is a continuous process. As far as their stand on international issues goes, each country takes its own decisions in their own manner. As we do. In some matters, we take Palestine's side, in others we take Israel's side. Sometimes we back Iran, sometimes the Arab nations. All countries have their own strategies in their national interest. There was a time when India had only Russia's support on the international stage -- and the rest of the world was with Pakistan. Today the entire situation has changed. Now only China stands with Pakistan and the rest of the world with India. We must understand this change. This is proof of our success. Q. What can we hope for from Pakistan in terms of tackling terror? The army is controlling Imran Khan, he is claiming India is warmongering because elections are imminent. A. India does not believe a single claim made by Pakistan. Pakistan has zero credibility here, and so no Indian citizen believes what is said in Pakistan. But, unfortunately, the opposition here speaks the same language as Pakistan. That is a cause for concern. India keeps having elections, there is an election every six months. So it's wrong to link the Balakot strike to elections. Q. Opposition parties have repeatedly asked you for proof on the Balakot strikes. They've asked where the number of 250 deaths have come from. Will you be providing any proof? A. When you're fighting an enemy, then this kind of language motivates the enemy, confuses the nation, and demoralises our soldiers. At a time like this, all of us must speak in one language to boost our soldiers' pride, to honour their valour. There have been many wars earlier, did anyone use such language then? Never. Many elections have taken place as well, no one spoke like this. Ever since the Congress lost power, they are hungry to regain power and have sunk to a new low. That's why they are speaking like this. As far as proof is concerned, Pakistan itself is proof enough. Why would they wake up at 5am and tweet? We were quiet. Pakistan itself has given proof. It's not that India claimed the attacks first. Q. First you carried out surgical strikes and then the Balakot air strike. But Lashkar and Jaish still strike with impunity in Kashmir. What is the long-term solution? Q. The Pulwama terror attack on the CRPF convoy took place on 14 February and I met you at the Rising India summit on 25 February, hours before the Balakot strikes. That evening, none of us could guess what was on your mind. You got the news at 3.40 am the next morning (26 February). What was going through your mind in these 10-15 days? A. I said on the very first day itself that Pakistan and the terrorists had made a grave mistake. And you could understand from my body language and my speech what I was feeling. But I don't take any short-cut, no decisions in a hurry. I consulted everyone, including the armed forces, on how to proceed. Our armed forces had already neutralised those behind the Pulwama terror attack. That was a big achievement in itself but I was not satisfied. If we did not strike at the heart of terror, where terrorists are nurtured, then they would not learn their lesson. Look at 26/11 and the attack on Parliament. Pakistan assumed we would not retaliate and it emboldened them. This time we thought, no more. We had conducted surgical strikes after Uri as well, but this time we felt that was not the answer. Air strike was the better option, so we took that option, and we were successful. And I believe we did this in consultation, taking everyone into confidence. Q. How is your manifesto different from other political parties, particularly the Congress? A. The name itself is different. Theirs is an announcement (ghoshna patra), ours is a resolution (sankalp patra). I would like the intellectual class to compare both our manifestos. Our manifesto should be viewed on the basis of our track record. The Congress manifesto should be weighed against their track record. There is a world of difference on many parameters. We are at the crossroads of eliminating terrorism. Terrorists are demoralised, we are winning a psychological war against them. Instead (of backing such efforts), the Congress manifesto is soft on terror. Their views on the Army are similar to those of Pakistan. No patriot will tolerate this language. Their manifesto talks about removing AFSPA (Armed Forces Special Powers Act). This amounts to removing weapons from a soldier's hands. Q. The BJP has released its manifesto on 8 April. My first question, what are the important aspects of the manifesto? A. This is a mature manifesto from a responsible political party which will be given the task of continuing to govern the country. For the first time, we have presented a manifesto which lays down a roadmap for both 2022 and 2024. This means the government's accountability is not just at the end of five years, but also mid-term. No party has ever done this before. We have spelt out 75 steps for what we want to achieve by 2022, the year in which India will celebrate 75 years of Independence. Secondly, by the end of the term in 2024, we want to finish laying the foundation for where the country should in its 100th year of Independence in 2047. It also lays out how to tackle black money and corruption. All facets of national security have been discussed. Earlier manifestos have done grave injustice to the poor, Dalits, downtrodden, deprived and tribals. There has been no time-bound programme for their development. What can be done for women, youth, and senior citizens? How can the lives of villagers and farmers be transformed? And how to build a modern India? How can technology be used for development and to meet the common citizen's aspirations? In the five years since 2014 we have worked to bring India out of a cocoon of despair, to bring in new era of self-confidence. We have focused on the needs of the common citizen -- housing, power, water, roads, etc. We have fulfilled basic needs in the last five years. The next five years we will work on empowering the common citizens to fulfil their aspirations. 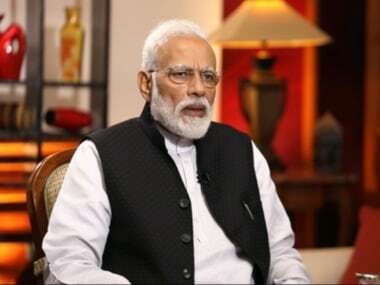 Prime Minister Narendra Modi gave an exclusive interview to Network 18 group editor-in-chief Rahul Joshi where he expressed his views on several issues, including demonetisation, Rafale deal and the Uttar Pradesh mahagathbandhan. The interview will be aired at 7 pm on CNN-News18. Q. You appealed to journalists to spread voter awareness. What would you like to tell the voter on ‘button dabao desh banao’ campaign (of Network18)? A. I urge all voters come out and cast their vote early in the morning. Pehle matdaan, baad me jalpaan (vote first, then breakfast). Voters today are very aware. There are long queues at booths. Urge voters to carry water to drink. I would like to urge peaceful polling and a heavy turnout. I would like to specially reach out to first time voters, people born in the 21st century. New voters deserve a special respect and a place of pride, for the first time they are about to cast their vote on national issues and be a party to the nation’s development. I urge first time voters to definitely come out and vote. Let’s also verify our names in the voters’ list online in advance. Let all voters to be part of this great election festival. Let democracy be eternal. Let’s move forward with this mission. Q. Many have said there have been problems in several institutions under your government. Two RBI governors had issues with the government, there was infighting in the CBI and four senior SC judges raised issues. How do you view institutional credibility? A. Such issues raised by the Congress are completely nonsensical. When they lose elections the Election Commission is flawed. They want the judiciary to run as per their whims and fancies. They’ll raise impeachment norms against the chief justice and then keep the issue hanging till their ends are met. The Congress is behind ruining every institution in the country. If anybody has empowered institutions it is us. These are the people who promulgated the Emergency, turned the country into a prison, jailed senior political leaders, muzzled the media and they talk about institutions? It doesn’t behove of them (to talk about institutional integrity). Q. How much importance do you give to the Priyanka factor in UP? Will it make a difference to the Congress’ tally and prospects? A. I feel it would be wrong of me to talk about any particular person. Q. In West Bengal as well? A. Across the country. You go to the North-east or to Kutch in the west, there is a wave across the nation. Q. Yesterday Mayawati openly appealed to Muslims to vote for the Mahagathbandhan and not allow votes to be split. The EC has taken note of this statement. How do you view such remarks? A. It is unsurprising that Mayawati is making such statements as she is facing defeat. She is appealing to Muslims to specifically vote for her. This is a matter for the Election Commission to look into. I am less worried about Mayawati. She is part of a sinking ship and is looking to Muslims for support. I am more worried about the secular brigade. Why are they silent? Had someone made such an appeal to Hindus, they would have expressed outrage. The 'award wapsi' gang would have returned their awards and a signature campaign would have started. Why is this group silent? This is a worrying subject for the nation. I request you to expose such elements. Why are they selective? Don't these remarks hurt their secularism? Did this statement boost their secularism? The biggest threat to India are these people who hide behind the mask of secularism. Mayawati is looking for a means to survive in politics. She will continue to try to gather votes by any means. Q. You say that you will get more seats as compared to 2014. How will you improve your tally in the Iindi heartland? In UP you have 73 seats (out of 80), in Gujarat you won all 26 seats and swept other states. In some of these states you won 168 of 178 seats. How is it possible to win more seats? A. If we go by these numbers, how do we see the election results of Tripura? We didn't even have one MLA in the state, now we have a three-fourths majority government. Had we only looked at this calculation, we would not have moved ahead. We had two Lok Sabha seats in 1984. In 2014, we became the first non-Congress government with full majority. I feel in politics it is not always about arithmetic. Q. How many seats do you think the NDA will get in these elections? A. Firstly, it is not me who decides how many seats we get, it is the voters who decide. 125 crore Indians have decided to grant victory to the BJP. We will form the government with a bigger mandate as compared with 2014. NDA allies will also increase their tally. The NDA's strength will rise in these elections. We will carry our governance agenda forward with the same selflessness and confidence with which we have worked in these five years. Q. That's why they have picked up another issue. Now their campaign is that there will be 'NYAY' (justice). They have taken out a NYAY scheme to give Rs 72,000 per family to the 20 percent poorest families. How do you look at this scheme? Will it be a game-changer for them? A. Their main slogan for this election is 'ab hoga nyay'. This means that they agree that in 60 years of their rule they have done anyay (injustice). So knowingly or unknowingly they have admitted that they have done injustice for 60 years in power. When they talk about nyay, what about justice for the victims of the 1984 anti-Sikh riots? What about nyay for the victims of triple talaq? What about the farmers of Chhattisgarh, Rajasthan and Madhya Pradesh who were promised loan waivers? You promised them justice in just 10 days. It has been 100 days now. When will they get justice? The victims of the Bhopal gas tragedy are asking why did the Congress allow the guilty to flee the country. They are seeking justice. The great scientist Nambi Narayanan was framed in a false case and put in jail. It dealt a blow to India's space program. Nambi Narayanan is asking for justice. You jailed innocent people in connection with the Samjhauta Express blast. They were in jail for so many years in a false case. They are asking for justice. In the name of the samjhauta case, you coined the term 'Hindu terror' to link Hindus to terrorism. This nation's Hindus are asking for justice. They want to know why they were branded terrorists. PV Narasimha Rao is asking for justice. Congress did not allow his body in the party office even though he dedicated his life to them. His soul is asking for justice. The great men of India, Dr Ambedkar, Netaji Bose and Sardar Vallabhai Patel are also asking for justice. Why weren't they given a proper place in history? Why were their contributions ignored? The call for nyay is coming from every corner of this country. I don't believe they are capable of delivering justice. "I have been in public life for years, I was chief minister of a state. Even the Congress leader of opposition said you can't accuse Modi of corruption. So, however hard they try, the people of India will never accept lies. The public is very smart, they understand these people. As far as the chowkidar slogan goes, in 2013-2014 when I was campaigning for the Lok Sabha polls, I used to tell people 'you make me the chowkidar and I will not let anyone steal India's wealth'. That used to be part of my speech. Even today I say I am the chowkidar and I will not let anyone steal. And if someone does, I am strengthening the law and taking strong action. The government has succeeded in creating an environment that encourages honesty," Narendra Modi said. Q. The opposition is trying to trap you with Rafale allegations. They even coined the slogan 'chowkidar chor hai'. You turned it around with 'main bhi chowkidar'. Where did you get this idea from and how did you bring it to the public? A. As far as rafale issue is concerned, even the opposition wasn't using it much. One individual kept repeating the same lie. And everywhere, these lies were rejected. Whether in the Supreme Court or by the CAG. Some neutral journalists also raised the issue of the money trail in Bofors. But here that individual spoke without any basis, how long could that have lasted? His advisors also told him that Rafale does not resonate as a political issue. His own people told him to let the issue be. But he wanted to wash the Bofors stain on his father by raising Rafale. Congress has been destroyed by defence scams. So they try to make the same allegations against all governments. During the Vajpayee government, they tried to trap George Fernandes in the coffin scam. It turned out to be lies. Now they are trying to similarly trap me. We are asking for proof to be shown in public but they are not giving any. They are only lying. That's why this issue is not flying, nor will it. Q. How do you see AFSPA? Will it be dealt with in a time-bound way? A. First, we must create an environment where AFSPA is unnecessary, like we did in Arunachal Pradesh. We removed it from a few districts. We then removed it from some states. We were the first to take such a step since 1980. But we have maintained law and order. The government must have the power to protect its armed forces. Only then will they have the morale to fight. Removing AFSPA from J&K is the same as sending our soldiers to the gallows. I will never let this happen to our soldiers. With the Lok Sabha Election right around the corner, Prime Minister Narendra Modi gave an exclusive interview to Network 18 group editor-in-chief Rahul Joshi. Modi spoke about a whole host of issues prior to the Lok Sabha polls right from demonetisation, the nationalism debate and why the voters will chose his government's track record despite the Opposition's claims of corruption against him. "Big people whose businesses were hit and exposed by demonetisation have still not been able to recover from the blow. But the common citizen who suffered initially due to demonetisation stood by us," the prime minister said in the interview, which will be aired today at 7 pm on CNN-News18. Modi slammed Congress leader Rahul Gandhi for raking up the Rafale issue, and trying to wash away his father’s stains linked to Bofors scam. “His advisors told him Rafale does not resonate as a political issue. His own people told him to let the issue be. But he wanted to wash the Bofors stain on his father,” Modi said in an interview with CNN-News18.